Project. 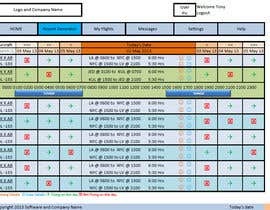 crew and aircraft rotations system. This will be a live project the successful candidate will get a 3 to 6 month contract at pay per month to complete the project and possible if the system is working very well will be put on a retainer. Will need to be very responsive as this will require some amount of work. project will not have to be complete when submitted however they will need to show the layout of the design along with some functions. not required to submit a finalised project. We understand that this is a big project and requires alot of work and we are flexible on the budget. but a project plan and layout is needed with a Beta test within 30 Days. 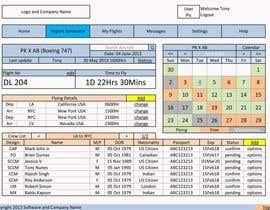 We would like to see a layout were we can view the schedule of the aircraft were we would manually input the schedule with timings in UTC, and we would see the aircraft rotation with dates and timings,(shown on drawing 1.) 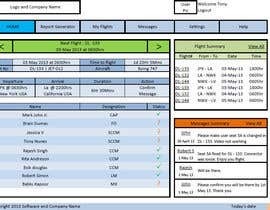 then we would be able to click on the flight and manually input/delete crew members as needed, Crew members would need to be stored in a database with names, three letter codes and designator and needed info. meaning are they cap, FO, MX. so we can see who is operating the flight this would need to be done so we would not need to re-enter the details every time. 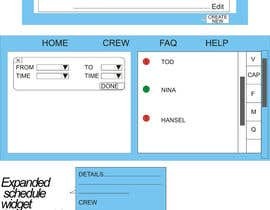 we would need to be able to print out schedules and crew reports etc. I don not want to give to much info as i would like to see fresh perspective on this. if we like a plan from you we will give you our inside on it to better reflect what we are looking for to before selecting the sucessful submission. please apologize if not all applicants will not get a feedback this will depend on number of submission. The only people that actually sent in a workable idea for me to consider are Saadyarkhalid and prolisoft therefore it as of now both of them have some understanding on what we are looking for and we will want to have a interview with them tomorrow or the next two days. as we are not just giving prize money we are giving a project lasting for a few months on a monthly retainer. well let me look at what we have on the board i may extend the contest for 2 or 3 more days, some designs look good so i will probably be questioning the people on how they will complete the project before awarding the prize. i am sorry i am traveling the last three days but i will look at this more closely tomorrow morning. Please don't believe the rumours posted by liouzhiguang. Please have a look at my feedback, he gave me five stars after I won his contest and delivered all the file accordingly. If I scammed him how left me with five stars? I don't know why he is posting this bad rumours against me but please do not trust liouzhiguang. I am a professional and qualified graphic designer and working in this field last 10 years. I have been doing good job by winning and having good feedback. Now he wants to ruin my reputation by saying all these rubbish. DO NOT BELIEVE HIM PLEASE! Hi, as I can it is still open, if it will be open for a day I can upload more sample forms and a chart according the excel file Thanks! Don't believe sultandesign from Bangladesh. He is a scammer. He scammer me 1000USD. I may not be able to complete this project fully however I would like to be involved in the design and planning. This is an interesting project, especially for me as I am involved in the aviation industry. So this will be a program, which someone uses for his daily work, but as You mentioned more than 1 people could use it. So we need a login and user-handling also, am I right? And if we have such a thing than probably an admin to handle the users. 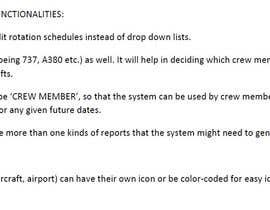 Do you plan to separate the rights (report generation for crew/aircraft, crew add/delete/edit, flight add/delete/edit, ...) or these 2 roles (admin, user) are enough? And besides the progress plan of the program, I need to make only layouts describing the functionality, that means some pictures, no half-working forms/windows/whatever, am I right? thanks for pointing out i am changing the website server. they havent changed it yet i have to check on it. it should be on google chache as this is very recent. - do You plan to use this system on tables, mobiles (small resolution) or some extraordinary big resolution (above fullHD - 1920x1080px), or this will be used almost all cases in an 'ordinary' desktop. - do You have any database I have to connect to, or I'll make design the tables myself for this project? for the correct project we will give a good contract based on 100 Hours of work per month for the correct and dedicated people. I need to do Design template or need to do also coding? What will be my roll? Make a project plan, give me the layout which shows the functions or how you will program the project. It is not required to submit a complete program i would only need a detailed layout and project plan with milestones and how system will work. and estimated time required to finish the program. it would be a work in progress i dont mind hiring the company or person permanently there is a alot of work to be done. saberoth, Do you want this to be an enterprise software or do you want it to be available to everybody as a website? I would prefer that this would work as online system were the crewing so called would be saved online as there may be more then one user working on this.